Do extensive research when it comes to the selection of your appliances. The market is inundated with advanced appliances but beware; use and storage needs should to be taken into account. Additionally, check for the Energy Star rating on each of the appliances you are considering. The higher the rating the more you will save on your energy bill. Check these ratings against the current federal tax credits. Two of the biggest appliance purchases are the refrigerators and stoves. There are many options to consider so take your time and do your homework. Think about how you use your refrigerator and freezer. Maybe a bottom storage frig/freezer is for you. Additionally, many manufacturers are making units that are either all refrigerator or all freezer that are installed below the counter level. This may be useful if your have a large family and find that a standard refrigerator/freezer is too small, or that you need to have appliances that fit a universal design. Although many commercial ranges and cook tops are marketed to residential customers be aware that there are things to consider if you plan to use one. Commercial ranges have a higher heat output that does not allow for a microwave to be placed above them. The intense heat will melt the appliance. Ventilation must be sized proportionately with the cook top or range it is servicing. For most standard ranges, a traditional off the shelf range hood will do. If you are considering a commercial size range, the ventilation must have equal ability to handle the high heat (btu) output. The cfms is the calculation of how much exhaust the hood will draw out over a calculated time or the cubic feet per minute. Another thing to be concerned with is the fact that a hood that draws exhaust to handle a commercial type range also creates problems for fireplaces specifically those with gas logs. The large volume of cfms creates what is known as negative air pressure within the house. Because gas log fireplaces have a fixed open damper and require the doors to be open during operation, this allows for the negative air to be sucked down the chimney and allows gas fumes to penetrate the home. To combat negative air pressure, a make up air system must be installed that will introduce fresh air each time the hood is turned on. This can be accomplished at the hood location via a custom hood or by other means including using existing ductwork to introduce fresh air into the home. Be careful of the placement if using existing or newly created make up air systems as the air is drawn from the outdoors and is tempered very little. So in cold climates, you could actually feel the difference in air coming out of the register. Although not necessarily thought of as one of the larger appliance purchases, dishwashers have come a long way. Although most are still moderately priced, some of the more advanced models can get up their in price. Dishwashers are now available with delayed starts, three tier racks instead of two as well as two drawer systems. Before starting out on your shopping expedition to select your appliances, consider the following for each appliance. Along with the above, heat sources need to be considered for ranges and cooktops. For those of you who like the high heat of a gas cooktop and the consistency of an electric oven, you're in luck as there are several dual fuel models on the market. 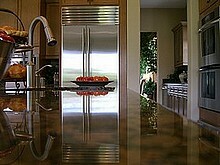 As stated above, do your homework as appliances are usually the second costliest part of a kitchen remodel. Although many American appliances have standard sizing, European models can vary slightly. It is important that you give thought to your appliances before ordering your cabinets or you may not be able to fit your appliance of choice in the allotted spacing. You should always verify the finished opening that the appliance will fit in before purchasing. Sinks also vary greatly so be sure and check manufacturer's specifications on your final selection. We will look at sinks and faucets a little more carefully later on.